Fractures is a medical term for a broken bone. It occurs when there is a exerted physical force that is stronger than the bone. And of cause due to certain diseases or medical condition like osteoporosis which leads to the weakening of the bone in turn making fracture of the bone more common. Open(compound) Fracture -An open fracture is a broken bone that penetrates through the skin. An operation is often required to clean the area of the fracture. Close Fracture -A closed fracture is a broken bone that does not penetrate through the skin. Compression Fracture -A compression fracture is mean a compression fracture of the spine or vertebral compression fracture. A compression fracture occurs when a number of vertebrae in the spine are broken. Stress Fracture -A stress fracture sometime also known as fatigue fractures, is a common overuse injury most often seen in athletes. It occurs when the forces are much lower but happen repetitively for a long period of time. Avulsion Fracture -An avulsion fracture is an injury to the bone in a place where a tendon or ligament attaches to the bone. When an avulsion fracture occurs, the tendon or ligament pulls off a piece of the bone. Green Stick Fracture -A green stick fracture occurs in child bone as their bone is still developing. It also means that one side of the fracture has broken and one side is bent; therefore it is classified as an incomplete break. Even though the bones may damage each other, they may not show through and damage the skin. This is called transverse fracture if all the damages are internal. A comminuted fracture in which bone is broken, splintered or crushed into a number of pieces. 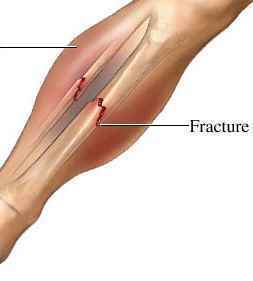 Impacted fracture is which the opposite sides of the broken bone are compressed together. Impacted fractures are commonly associated with hip fractures and fractures that occur when a person attempts to break a fall with outstretched arms. Self-Diagnose can bring more harm than treating it. It is good to know more about the injury but definitely not to the point of self-treatment. It will be much safer to get treated by Our Doctor, for more information or to book an appointment with Singapore Sports and Orthopaedic Clinic, you can call (+65) 6475 8011, the hotline is open 24 hours. You may also send us an enquiry for appointment.